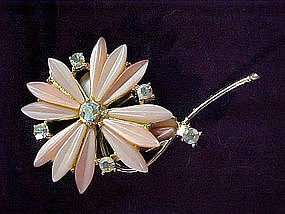 Large costume flower pin.Probably 1950's or 60's Dahlia like flower pin made of formed pastel pinks for petals, accented with aurora colored rhinestones in a gold setting. Pin measures 3 1/2" at the longest points. Cannot find any makers marks, but is a nicer quality pin, like Coro. No missing stones or flaking on the metal. Very nice. A real pretty pin for your collection. 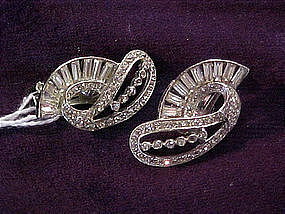 Lovely elegant pair of vintage rhinestone earrings. 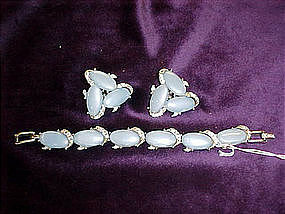 Clip on style.Set in silver tone setting. No chipping or flaking. Good quality, interesting cutting style of stones. Both are well marked with makers name on each. 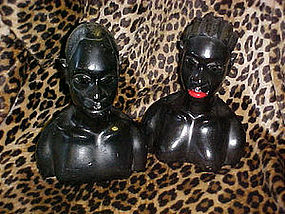 Pair of chalk african man & woman busts. These are a matched set. I'm not sure of the age, but most likely 40+ years of age. They are solid cast, with nice weight. They measure about 9 1/4" tall. Nicely sculpted to appear life like. Good condition with the exception of a few chips on the bottom. ( These are not noticeable when sitting on the table. Nice example of African art. Email for more photos. 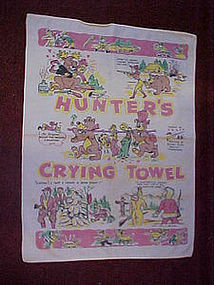 Comical printed hunting characters on a 18 x 24 cotton towel. This an original "Willie the Weeper" creation. The characters have you wondering whos hunting who? This is just priceless. No tears, stains, or mending. Very nice condition. Has been washed and used.A cute collectible for a man who loves sports & hunting memorabilia. 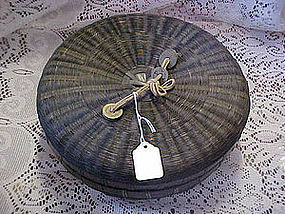 Old woven chinese sewing basket with original decoratin of cord handle with brass oriental tokens for decorations. It is round, and 10 1/2" in diameter.4" deep with lid on. Basket is dark brown (almost black) in color. The inside of the lid and bottom have a herringbone weave. The outside has a totally different weave. It is in excellent condition. There is not even the slightest break in any of the weave. Very carefully kept. I have more photos if you ned to see them. Anchor Hockings, Fireking, Ivory swirl mixing bowl. 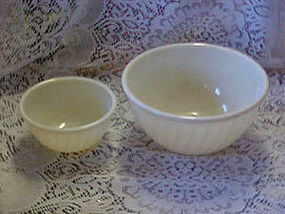 The large bowl measures 9" in diameter. Very nice condition. No chips cracks or scuffing. Picture shows two sizes. 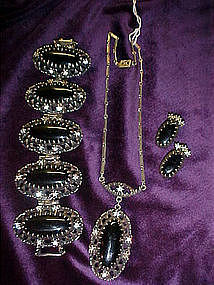 This is the largest one shown.I have 2 available, price is for each. 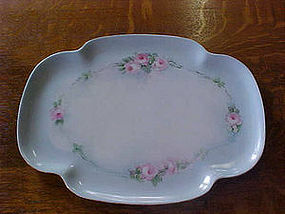 12" Haviland France Platter. Hand painted in soft pastels. White center with powder blue border. 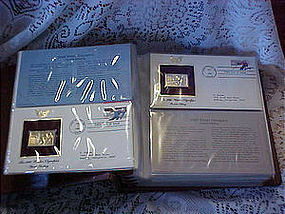 Gold trim on extreme edge. Hand painted pastel pink roses in an oval garland. Very pretty, with a unique shape. No nicks, chips or cracks. Haviland stamp on the back. See photos. These are cute little 2" tall salt and pepper shakers. 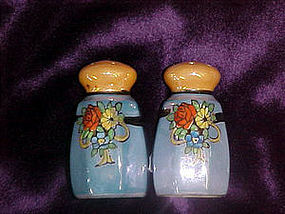 They are blue & gold lustre with black trim and hand painted floral centre design. They have the red japan ink mark. Still have their original corks also. Very nice condition, with no chips or cracks. I have two identical sets. Price is for one set. Let me know if you would like one or both sets. 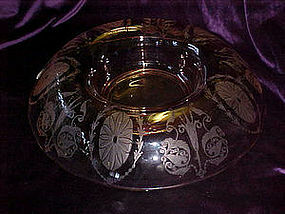 This is a decorative german ashtray, made of china. 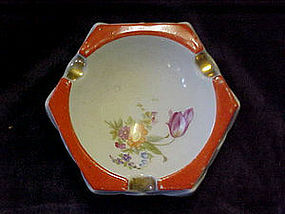 It is decorated with orange trim on a white ashtray with multi color floral in the bowl area. It has gold trim. It is 1 1/2" deep and is 4" wide with 3 cigarette rests. 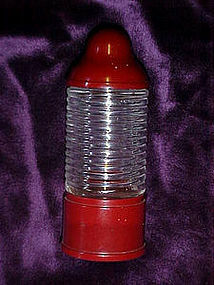 Marked in red double circle "Made in Germany". Some minor flaking to the orange trim area. No cracks, or chips. 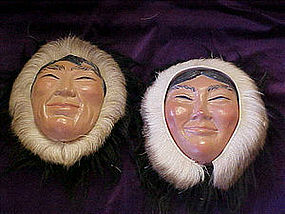 This is a pair of eskimo faces made of a type of what looks to be a type of composition or plaster casting. They are hand painted and very realistic looking. The faces are framed with real caribou fur. They really are awesome. They have a cardboard backing. Overall, each face is about 9" tall. The paint is excellent. They are very beautiful and lifelike. Anchor Hockings Gay Nineties series, tall tea glasses. Forest green, set of four, all different. Decorated in white characters, a different scene on each. 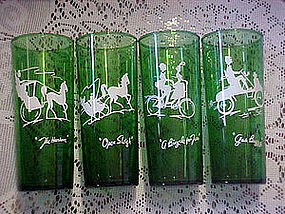 "The hansome", "Bicycle built for two" "Open sleigh" & "Gas buggy". All are in perfect condition. No discoloration to the white decoration. Looks as though they have never been used. I have two sets availiable if you would like a set of 8. Discount for buying two sets. Wall plate made by Lefton China. depicts a little boy in his blue jammies saying his nitetime prayer. 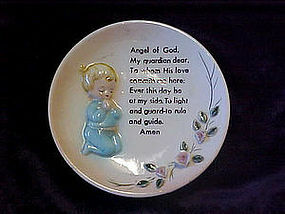 Prayer is printed on the plate also. Boy is molded into plate. Other edge has appled ceramic rose garland. Lefton sticker still intact. # 3215 on the back. No chips or cracks. 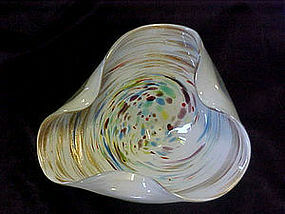 Pretty murano style freeform dish. White cased with clear and spun colors of turquoises, reds, browns, & yellows. I believe it has mica in it. These copper colors have the glitter effect that looks like mica. All of these pretty colors spiral from the center of the dish out to the extreme edges of the dish. 7 1/2" wide at the widest point, and about 2" deep. Perfect condition!